Winter is a great time to photograph mountain waterfalls & streams, especially since most of the Blue Ridge Parkway is closed in Winter, limiting access to mountain vistas and landscape scenes. We especially enjoy going out during or after a cold snap when the waterfalls & streams will be graced with ice, icicles and mist frozen on branches. Rhododendrons are often found growing around streams and waterfalls, providing a welcome pop of green color to compliment the scene. We visit some of the most photogenic but lesser-known waterfalls and mountain streams in the area. Tours include large, majestic waterfalls and mountain streams with small falls and intimate rills. In addition to capturing the full waterfall scene, you will learn how to make a dramatic image with a smaller section of a waterfall or stream. 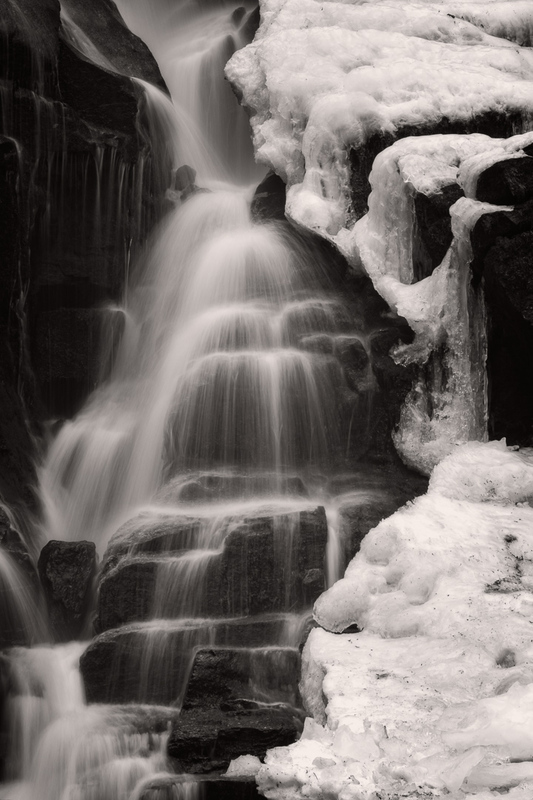 We will explore the feeling and essence of the water and ice to create a story. We strongly suggest bringing a tripod and neutral density filter if you would like to create a silky water effect. Absolutely loved this tour! Learned so much about composition and camera settings. Chris and Bonnie definitely know and love what they do. I can’t wait to do another one. As a bonus, I was able to see a part of NC I had never seen and it was gorgeous!